Peace FM's correspondent, Wiafe Akenteng reported that two buses with registration numbers, GT 5694 18 and GT 3916 17 coming from opposite directions crashed head-on in the early hours of Friday. According to the reports the KIA Grand Bird bus caught fire and got burnt after the collision. The road affected is one of the important routes connecting two parts of the country. 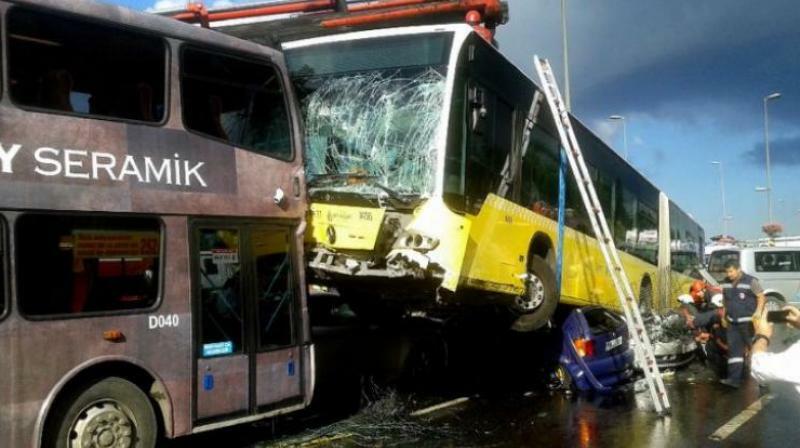 Each bus was carrying about 50 passengers at the time of the crash. Police are yet to ascertain the real cause of the accident. One of the buses caught fire, leaving people burned beyond recognition. Those with several degrees of injury have been transported to Jema, Kintampo and Techiman hospitals for treatment. Speaking to the local TV station TV3, Kintampo's fire service commander, Ankomah Twene, said: "Some of the survivors are telling us that their driver was feeling sleepy at some point during that time of the night, so he was asked to park, but he refused". He said they sustained head injuries and bruises on their bodies. An average of six people die every day on Ghana's roads. The VVIP bus veered into a ditch killing many.